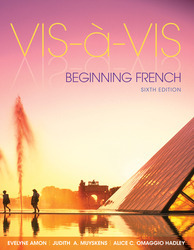 Vis-à-vis engages students with its unique integration of contemporary culture and communicative building blocks, providing the tools they need to build a solid foundation in introductory French. The proven qualities of Vis-à-vis are well known: an easy-to-navigate chapter structure with four lessons in which vocabulary, grammar, and culture work together as integrated units; an abundance of practice activities that range from form-focused to communicative; a balanced approach to the four skills; diverse coverage of the Francophone world that includes an outstanding video program featuring bloggers and cultural footage from eight different Francophone regions. In its sixth edition, Vis-à-vis, continues to evolve to meet the changing needs of instructors and students by responding to feedback from these users themselves. Employing a wide array of research tools, we identified a number of areas for potential innovation. The new program builds upon the success of the fifth edition with an expanded emphasis on contemporary language, pronunciation, culture, and technology to create a truly communicative, interactive experience. On the digital side, this new edition offers Connect French and LearnSmart, with their unparalleled adaptive and digital learning resources. These powerful tools, now an integral part of the sixth edition, complement and support the goals of the Vis-à-vis program and address the needs of the evolving introductory French course. Connect is the only integrated learning system that empowers students by continuously adapting to deliver precisely what they need, when they need it, and how they need it, so that your class time is more engaging and effective. Connect French and LearnSmart are sold separately and do not come automatically with the purchase of the textbook. Interactive vocabulary presentations (Paroles), available within Connect, allow students to listen, record, and practice the new vocabulary at home. Prononcez bien! activities with a recording feature provide students with opportunities for discrete-word and contextualized practice that gives them more confidence in their speaking abilities. Seventeen Grammaire interactive tutorials, each with a brief practice quiz, focus on structures that students typically struggle with. LearnSmart, the only super-adaptive learning tool on the market, is proven to significantly enhance students’ learning and improve course outcomes. Available within Connect French and as a mobile app, LearnSmart provides students with targeted feedback specific to their individual performance, and additional practice in areas where students need help the most. Voice Board and Blackboard IM, two powerful tools integrated into Connect French, promote communication and collaboration outside the classroom. Vis-á-vis offers a balanced, four-skills approach to learning the French language. Easy-to-navigate chapter structure with four lessons in which vocabulary, grammar, and culture work together as integrated units. Abundance of practice activities that range from form-focused to communicative. Diverse coverage of the Francophone world that includes an outstanding video program featuring bloggers and cultural footage from eight different Francophone regions. Le vidéoblog de… and the stunning Bienvenue video segments give students a window into the sights and sounds of eight different French-speaking regions/countries: France, Belgium, Switzerland, Quebec, Louisiana, Tunisia, Senegal, Martinique, and Tahiti. Chapitre 3 Elles ont l‘air chic! Chapitre 8 Vive les vacances! Evelyne Amon studied at the Université de Paris-Sorbonne. She holds a DEA in modern literature, a Diplôme de didactique des langues in French as a second language, and a CAPES in modern literature. She has taught French language and literature at the secondary and college levels, and for many years has led a training seminar in Switzerland for professors on advances in methodology and pedagogy. Lately, she has conducted several training sessions in teaching French as a second language for teachers at the French Institute Alliance Française (FIAF) in New York. As an author, she has written many reference volumes, textbooks, and academic studies for French publishers such as Larousse, Hatier, Magnard, and Bordas, and she is currently working on a project for Hachette. She is the author of the McGraw-Hill French reader C’est la vie! and has written for successive editions of Vis-à-vis. She lives in Paris and New York. Judith A. Muyskens, Ph.D., Ohio State University, is Provost and Professor of French at Nebraska Wesleyan University. She was recently a Professor of Humanities at Colby-Sawyer College, New Hampshire, where she served as Vice President for Advancement. She continues to teach French language courses when time allows, especially first- and second-year language classes. For many years, she taught courses in methodology and French language and culture and supervised teaching assistants at the University of Cincinnati. She has contributed to various professional publications, including the Modern Language Journal, Foreign Language Annals, and the ACTFL Foreign Language Education Series. She is a coauthor of several other French textbooks, including Rendez-vous: An Invitation to French and À vous d’écrire. Alice C. Omaggio Hadley, Ph.D., Ohio State University, is a Professor Emerita of French at the University of Illinois at Urbana-Champaign. She is a coauthor of the French text Rendez-vous: An Invitation to French and is the author of a language teaching methods text, Teaching Language in Context. Her publications have appeared in various professional journals, and she has given numerous workshops throughout the country.